The city’s newest light rail line is breaking ridership records, but its impact is also being felt in development and land use. New mixed-use projects are springing up along the 15-mile Expo Line, especially along the rail’s new extension from Culver City to Santa Monica. 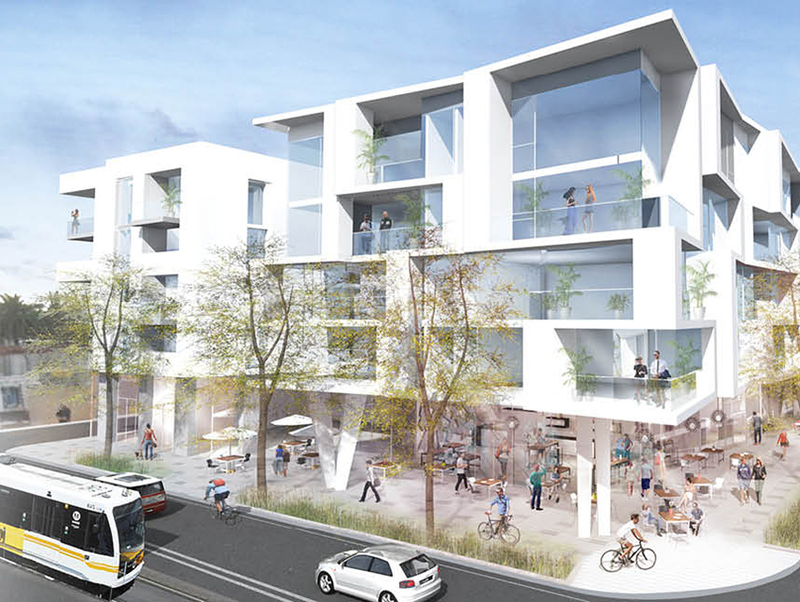 Santa Monica officials just green-lit two new residential projects for Lincoln Boulevard, the notoriously ugly and traffic-clogged artery that the train bisects on its way to its western terminus. All in all, six apartment buildings—nearly all with ground-floor retail—are planned for this stretch of Lincoln. The developments will bring 623 units of new housing to tech-rich, growth-averse Santa Monica. The new projects are mostly replacing drive-in, drive-out retail businesses that catered to Lincoln’s past designation as a pedestrian-unfriendly state highway. One of the new projects just approved by the city’s architectural board calls for new 20-foot sidewalks on Lincoln. That will only address one small section of Lincoln though; the boulevard remains littered with parking lots that abut the sidewalk and lube and car wash places that are not pleasant to walk by. The city is aware of Lincoln’s failings, though. Planners want to change much of its length to a mixed-use community, with businesses within walking distance of residences and an easy route for bikes, bus riders, and pedestrians to reach the Expo Line. Part of that endeavor includes the newly-approved Lincoln Corridor Neighborhood plan, which will help transform the boulevard in various phases. LiNC’s first phase, to hopefully begin this month or next, will include new peak-hour bus-only lanes, improved lighting, additional street trees, bike racks, and new medians and curb extensions to make crossing Lincoln on foot less terrifying. The transformation of Lincoln will follow the makeover of a former dead zone in Culver City, where the Expo station now sits. Where abandoned car dealerships housed graffiti and dumping, new apartments and retail options invite street traffic and train patronage. An eye-catching office tower looks to have begun work near the La Cienega station. Over at the Sepulveda stop, ground has broken for a 13-story mixed-use tower that will enliven a desolate area south of Pico Boulevard. Work is expected to begin soon on the makeover of a former car dealership near the Bundy station into a massive, mixed-use development that will hopefully make the corner of Olympic and Bundy less of a freeway and more a place that people actually want to visit and live.